So in 2018 we moved office locations and this year we are moving once again (in June). But this time just across the hall - which gives us over double the space which will allow us to accommodate our growing team size! In the last 2 years we have also branched out and began offering local services (under the Norwind Solutions brand), which has also grown and become popular among local consumers and businesses. The goal is to be a high quality 1 stop shop for almost all things tech, and so far we are succeeding. So let's talk Astraea. I get emails and messages on a regular basis asking for updates and when the game will be out. As you may or may not know, we are 100% self funded. We don't have loans, grants, or any external forms of funding. Everything we do is payed for by the work we do in that month. So to pay rent, payroll, internet, etc we need to obtain and complete contracts just to pay the bills. So unfortunately that has left Astraea receiving not enough love in the last little while. What I can say though is I have kept Astraea up to date (updated Unity, updated net code, server backends, etc.). I'm hoping to ramp up production on Astraea in the next couple weeks to start delivering some great updates. Last but not least I do have a little quiet announcement to make. With all the excitement of battle royale games as of late (I'm a fan of many), I thought to myself - what would be a unique spin on the BR genre. Well I've been tinkering with a new idea which can be played today! Announcing, FP Runner Online. A 200 player, head to head online battle royale style game. Up to 200 players can go head to head in an endless runner. Last person standing wins. You can visit the games tab to see all the details and grab the download link. Oh and it's 100% free to play! FP Runner Online is cross platform and is in a pre-alpha state. It's fully playable, but expect server wipes from time to time. For our internal projects, the priority is definitely Astraea. But we will devote a portion of our time to this game which will hopefully see a full release sometime soon. dalegribble says: Ever think of doing a kickstarter for Astraea? I'd totally support that! Apr 17, 2018 We Are Moving! Again! It seems like it was just 4 posts ago that we were opening and moving into an office - but here we go again! We are currently in the process of moving into a new office! As a result, we will be slightly less accessible until April 30th, but we will do our best to reply to messages as soon as possible. Sep 28, 2017 Xbox Live Indie Games - Battle Cubes Giveaway! If you have not heard already, Xbox Live Indie Games (XBLIG) is shutting down for good on October 7, 2017. As a result of this, Battle Cubes will no longer be available on the Xbox 360. We have been told you should be able to re-download the game after this, as long as you have previously purchased the game. To be safe though we strongly recommend you download and fully update the game prior to October 7th. We don't know if the game will be playable after this (as it's a multiplayer-only title) but it could still work as it runs off the Xbox Live network. After October 7th, we will be archiving Battle Cubes and Gem Sword from our website. These games will no longer be available for new users. Battle Cubes was our first real step into the gaming industry and our first experience on a console platform. It was a neat experience and provided us with the necessary knowledge to move on to bigger and better games. To those who played Battle Cubes and enjoyed it, we thank you for dearly for helping support us! Josh says: wow got one thanks!! Aug 13, 2017 Astraea Update – Approaching Beta! Hi everyone! We just wanted to give you a quick update regarding the current state of Astraea. We are in the process of working on a large game update, which changes and adds a lot of new content. Many of these changes will be available in the Live Development version of the game shortly. In the meantime, we wanted to update the stable version of Astraea. It’s been nearly a whole year since the last update so a number of a things have slowly stopped working (multiplayer being one thing)! So as of today we have released a shiny new update that fixes a large number of outstanding bugs and re-enables the multiplayer functionality (including the Social Hub). This update doesn’t include any of the new content, but that will come soon. There may be some smaller bugs outstanding, but we will be releasing updates more often. If you notice anything not working as it should – please let us know! Lastly, regarding the next new content update – this will bring us right into a beta state. We don’t have a firm date as to when this will happen, but we expect the game to remain in beta for a month or two before moving into a final release. As we have progressed with Astraea’s development, we have increased the price at each milestone. Following this pattern, we will be increasing the price of Astraea to $19.99 once we reach beta, and $24.99 once we reach final release. With the amount of new content and features coming soon, we think it will be a fair value. If you have purchased the game in the past or present, you of course will continue to receive all future updates and receive the full game upon release. Jul 05, 2017 Astraea "Live Development"
Today we are excited to announce a new feature we've added to the Norwind Client. We are calling it "Live Development". This new feature allows Astraea owners to play the very latest version of the game immediately. As we work on the game and literally every time we save our code, maps, files, etc the game will instantly update and be available for download. In a single day there will likely be multiple updates. This gives you players a nice and easy way to view the game as we are working on it. It's important to understand what you are getting into before blindly activating this feature. 1) Once you activate Live Development, you will be unable to use the public builds of the game temporarily. Once you begin playing the game your Astraea save file will be incompatible with the publicly released version of the game. This limitation will be in effect until we release a new public update. Once that happens Live Development will be turned off for EVERYONE. 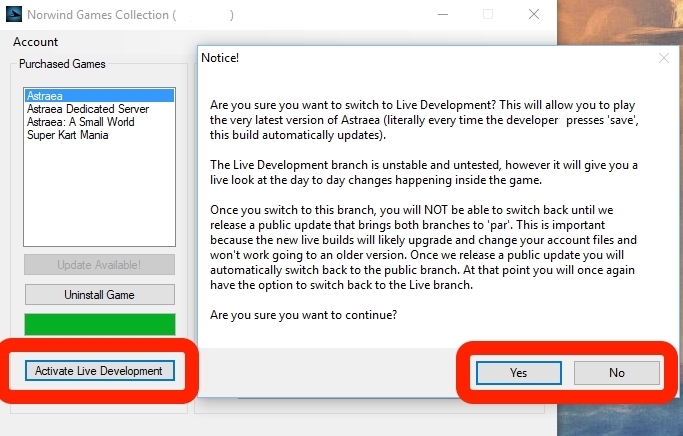 After the public update is released you will once again have the option to activate Live Development. 2) Live Development players cannot play online with regular public players. If some of your friends have Live Development activated, you will either have to wait until the next public update or you will need to activate Live Development. 3) Windows Only. The Live Development feature actually deploys the Mac and Linux versions of the game as well, however right now we have no means of distributing these builds. If there is demand we can create the Norwind Client for Mac/Linux which would allow for Live Development on those platforms. 4) As is the nature of this feature, the Astraea builds will be entirely untested and unstable. If we accidentally save some bad code and the game crashes, the system will automatically know not to publish it to the Live Development update. However we will be adding and fixing features on a daily basis, so one day you might login and see something that doesn't work, but in the evening it suddenly does. So expect many changes daily! I think that covers most of it. If you are interested in activating Live Development on your account, but have questions or concerns, please contact us with any questions you may have!